Yeppp....in case you wondering why you won't see anything from me for a while, it's because I won't be around. I have a summer lab to attend starting tonight and it will be every day from 10AM to 10:30PM, plus an hour of driving time back and forth, so no time for anything. 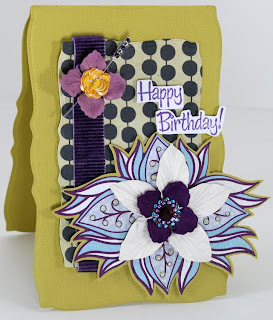 Anyway, before I leave, I have a card to show you that I haven't showed yet, and it is made with the Urban Anthology's June kit, so I thought I would share it. Hope it ties you through till I come back...hehehe. That is all I have for you now and wishing you a wonderful weekend and week coming up as well!